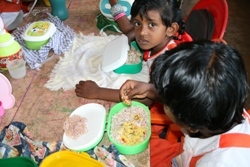 Over twenty pre-schools destroyed in the Hambantota District need to be rebuilt. At a cost of around of around £ 5600 each, they are essential in providing care and stability for the very young children affected by this disaster. It also enables parents to work and older siblings to return to school. This need continues. 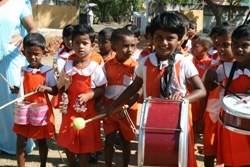 Senehasa Association has rebuilt six pre-schools in the Hambantota District since April 2005. Each pre-school has 30-50 children and at least two teachers. 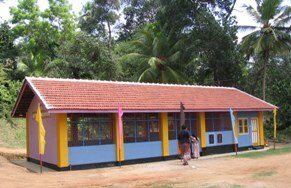 Five pre-schools are built on land given by and in the local Buddhist temple and one is built on land donated by an individual. Parents and children attended the opening ceremonies with great excitement. Following a traditional Buddhist blessing, a brass lamp was lit and kiribath (milk rice) was served to bring good fortune. Each opening ceremony was carefully planned to take place on an auspicious day and time – a custom in Sri Lanka. The pre-schools are now a safe-haven for the children. Typically these pre-schools have little or no toys, some basic furniture and basic materials. Each school has now received building blocks, lego, picture books, musical instruments and other educational toys. The teachers have received further training so they feel confident to encourage children to learn through play rather than by rote. Since they first opened in 2005 and 2006, all the pre-schools have become well established in their communities and some are over subscribed. They all have excellent teachers and the children seem to be happy. 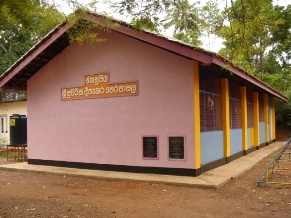 Pre-school in the Galle District. 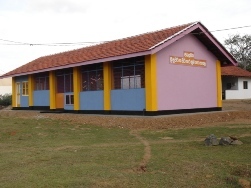 Another pre-school has been completed in the Galle District. The Singithi Pera Pasala (pera pasala means pre-school) has been built in the grounds of the Siri Kettaramaya Vihara (vihara means temple) in Tittagalla East near Ahangama. It is a beautiful location – the temple is literaly built on “island” surrounded by paddy fields and a tea plantation. It is now flouirsishing.